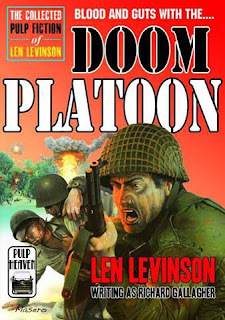 Nice to see more and more old pulps getting reprinted. You read it on your phone? I've never understood why anyone would do that. One of my editors at Osprey read my novel on his phone, and it runs to 95,000 words! Save your eyes, man! This is Len Levinson speaking. Thanks for the great review. I haven't read this novel for a long time but remember having a great time writing it. It was my first war novel and I felt like a virgin. You mentioned that I was partnering with Ben Bridges. I never heard of Ben Bridges. I deal with Dave Whithead. Sorry about the confusion, Len, Dave Whitehead is Ben Bridges - that's Dave's pen name.